This features scans all the code of your project showing those types of comments. Hopefully you find this feature useful. 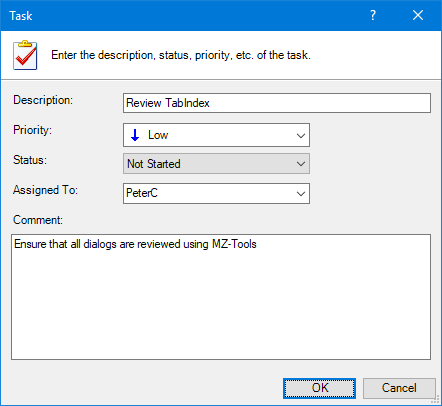 Enhanced [#12326] (VB/VBA): The Task List provides now a new tab page to show code tasks (‘ TODO: comments) apart from general tasks. Enhanced [#12287] (All): The commands GenerateXmlDocumentation and GenerateHtmlDocumentation can be now automated. Fixed [#12307] (VS): The Add Line Numbers feature numbered lines after initializer ‘=’ in VB.NET 10.0 or higher. Fixed [#12234] (VB/VBA): The Code Explorer could still cause System.NullReferenceException when closing. Fixed [#12247] (VB/VBA): The Select Case Assistant didn’t parse correctly enum items with comments or conditional compilation directives. Fixed [#12247] (VB/VBA): The Select Case Assistant could be very slow in some scenarios. Fixed [#12347] (VBA): Using MSForms, pages of a MultiPage control were not retrieved on Windows 7. Fixed [Internal] (All): The window to select a code template didn’t have the correct tab order.